DGLO August 5,6,7 this yr if we get 150 players signed up by June 1st they will close the course and we will get beer. So come sign up. Thank you though for the support and sponserships in Midland, I look forward to playing rounds with you this year. 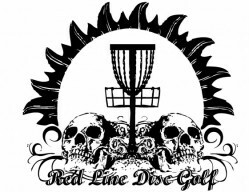 The last 3 yrs that my brothers and I have run Red Line Disc Golf have been some of the most memorable that I have ever had, but like all great things they come with a price and ultimately will end at some point. After the conclusion of last season we started to realize that that our venture was taking a back seat to your personal lives, and regardless of how hard we tried the days just seemed to be to short. So it was with both relief and sadness that we decided to discontinue any and all production of Red Line Apparel. We would like to thank our sponsored pro's (Pat Burke, Katrina Witucki, Daemon Stahlin, and Erin Oakley) you guys were the driving force of this venture, and did a great job of spreading the word. We wish you all the best, and like I've said before I know you will all do great things! I think that Andrew and Jason are done with disc golf, however I'm still planning on playing in the spring so I will see you all from time to time. ALERT >>>>>>>>.. Where the hell you been? Still alive? Doing well? Havent heard from you for ever how ya doing buddy? yeah where have you been? what up though? Just dropping you a hello and how ya been. thanks! I hope all is going well with you. States was fun like always! Thanks Scott. I would love to have a team get together! Pick a date and see who's available. well I am glad you showed up, we had a good turn out and I am glad to see everyone had fun. I will see u at farm classic! Sorry as well Scott. got a few comments all my shirts though! and hit an ace woo-woot! 2nd day 2nd hole! 220 ft. uphill blind shot. $3?? Team Red Line Woo-Woot! nice. You playin dubs at sanford today?